At 1,943 feet deep, Crater Lake is the deepest in the United States. This adventure in and around Crater Lake highlights the beauty of Oregon in more ways than one! 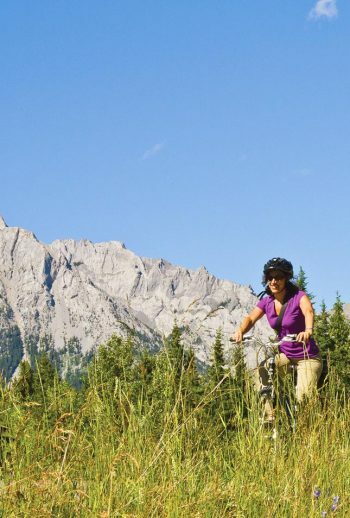 From hiking to the tops of peaks with 360 degree views in all directions to pedaling down pleasant bike paths without a care in the world, this trip is sure to challenge yet relax you at the same time. Hike forested trails on the lookout for colorful flowers like Macloskey’s Violet, broadleaf lupine, and Lewis’ monkeyflower. Stare into the bright blue depths of the deepest lake in the United States, formed by the collapse of an ancient volcano. Walk the streets of the beautiful town of Ashland, nestled at the base of the convergence of Siskiyou and Cascade Mountain Ranges. Take on the thrill of class III and IV whitewater on the famous Rogue River. Take in the beauty of Crater Lake National Park with Austin Adventures! There’s a legend in Oregon that when the first Crater Lake visitors with color cameras took their photos to be developed, they were reimbursed for what Kodak assumed was an error in the printing process. Little did Kodak know, the impossibly bright blue hue of Oregon’s Crater Lake was, in fact, real. Discover the awe-inspiring beauty of Crater Lake and beyond on this six-day, exclusive Crater Lake Tour through Oregon’s southern region as you taste the wonderful offerings of local cheeses, wines, beer and fresh produce. This guest-favorite Crater Lake Vacation package truly is an experience for the senses! Crater Lake: at 1,943-feet deep, it's the seventh deepest lake in the world and the deepest in the United States. The Tony Award-winning Oregon Shakespeare Festival: founded in 1935, the theater is among the oldest and largest professional non-profit theatres in the nation. See it with our Crate Lake Vacation Package. The "magic" mineral water at Lithia Springs Resort: guests have claimed the water that the resort uses to fill their whirlpool tubs have cured all sorts of ailments, from poison oak to insomnia. Shuttle from Medford to Crater Lake National Park (1hr 40min). After a short welcome meeting, embark on your first short hike to Natural Bridge. Then, enjoy a delicious guide-prepared picnic lunch near Crater Lake Lodge. This afternoon, a short but strenuous hike takes you up to the lofty summit of 8,060 foot Mount Garfield. The views from the summit are far reaching, encompassing the entire lake, Wizard Island, Phantom Ship and the high peaks of the south Cascades. For the next two evenings we overnight in rooms at Crater Lake Lodge, the only ‘in-park’ lodging in Crater Lake National Park. Crater Lake National Park is one of the country’s crown jewels. No place else on earth combines a deep pure lake, so blue in color; sheer surrounding cliffs, almost 2,000 feet high; a picturesque island and a violent volcanic past. Begin your journey by lodging in the historic Crater Lake Lodge, the only “in-Park” lodging where you will be surrounded by an authentic rustic northwest atmosphere. Enjoy morning coffee as you watch the sun rise over the lake, or spend a quiet evening relaxing by the fireplace. Spend your days gazing at the lake from more than 20 scenic overlooks during a breathtaking trip around Crater Lake on Rim Drive. This morning we hike down to Crater Lake to get a different perspective of the crater on a National Park Service boat tour. Our NPS boat guide will educate us on the history, geology and cultural significance of the lake, while we take in the natural beauty of the caldera from the boat. Enjoy a sack lunch while transferring back to the boat dock. The toughest part of our day will be hiking the strenuous trail (equivalent to climbing 70 flights of stairs) back up to the trailhead! This afternoon, enjoy an optional beautiful hike with your guides. Relax with some downtime before this evening’s dinner which will be back at the lodge. Sleep well on your last night in the Park. Breakfast and a short shuttle will bring us to the start of our bike ride. The paved trail winding around Diamond Lake offers magnificent views of Mount Bailey and Mount Thielsen. Picnic lunch at Diamond Lake. Begin the transfer to Ashland (~2 hours); along the way, jump on one more short hike to Mill Creek Falls where there’ll be an opportunity to scramble or climb around on “Avenue of the Boulders” at the falls’ base. Continue on to Ashland and settle into Lithia Springs Resort, your home for the next three nights. This evening is yours to enjoy as you wish. Walk around downtown and enjoy dinner and the nightlife of Ashland or just relax and catch up on a good book. Located in the valley between Cascade and Siskiyou mountains, outside of Ashland, Oregon, Lithia Springs Resort features healing, mineral warm springs (94°F) piped into private soaking tubs located in your comfortable bungalow. The curative springs are rich in sulfur and numerous minerals, which help the body heal, relieve stress, and rejuvenate. The resort grounds include beautiful flower gardens, arbors, koi ponds, and secret hideaways. This place is an oasis of tranquility and beauty with its quaking aspens, fruit trees, grapes, and colorful rose and berry bushes. A spa exists on site featuring massage therapists with years of experience offering such services as Side by Side Massages and Thai Yoga Massages. Enjoy your time spent in this private sanctuary that celebrates healing waters and nature. After breakfast, load up and head towards our “put in” at the Rogue River. Rafting the Rogue should be on everyone’s to-do list! Today is an introduction, not only to the Rogue, but to white water rafting in general. A scenic setting starts with mellow riffles and rapids and uniquely progresses from class I introductory rapids to the exciting but safe class IV whitewater. Beautiful scenery, sparsely populated, and a variety of birds and waterfowl add to the many memorable pleasures. After our “take out”, we’ll take a leisurely bike ride to several wineries in the Rogue Valley • Tonight, enjoy dinner with the group in Ashland. After breakfast, on today’s agenda is a drive to Oregon Caves National Monument (2 hour transfer). Nestled deep inside the Siskiyou Mountains, these caves formed as rainwater from when the ancient forest above dissolved the surrounding marble and created a special marble cave system. We’ll tour the “Marble Halls of Oregon” and then enjoy lunch outside the caves. Drive back to Ashland and get ready for an unforgettable evening. After dinner we make our way over to the Oregon Shakespeare Festival to experience a live performance in one of the incredible theaters. This morning, pedal your bicycle along Bear Creek Bike Path before you depart. Then we reluctantly say our good byes and shuttle to Medford for early afternoon drop offs. Please plan on arriving at least one day prior to your trip departure. Day one of your itinerary starts at 8:15 am at the Courtyard Marriott in Medford. Your trip ends with a drop-off at either the Medford airport (12:00 pm) or your Medford hotel (12:30 pm). Hiking: 2 to 4 miles per hike, easy to strenuous in difficulty depending on trail. Sometimes multiple hikes will be done in a day. Biking: Up to 11 miles, easy to moderate in difficulty. Whitewater Rafting: Class II – IV rapids, no experience necessary. Safety tips and paddling instruction provided by professional river guide. Crater Lake Boat Tour: Must be able to “hike” down and then back up the equivalent of 70 flights of stairs to get to the boat dock. This trip highlights beautiful Crater Lake, the deepest lake in the United States with a maximum depth of 1,932 feet. The lake was formed after the collapse of an ancient volcano, posthumously named Mount Mazama, which violently erupted approximately 7,700 years ago. That eruption was 42 times as powerful as the 1980 eruption of Mt. St. Helens! Did you know that there were no fish in clean, clear, cold Crater Lake until they were introduced by humans? Today rainbow trout and kokanee salmon still survive within the depths. Check out Oregon Shakespeare Festival, making sure to catch a live performance in one of the three theaters on campus. Raft the exciting class III and IV whitewater of the Rogue River, making sure to learn of the controversies surrounding dam building and removal dating back to over a century. Experience the Oregon Caves nestled deep inside the Siskiyou Mountains. Come explore “the Beaver state” with the experts in adventure travel! Any necessary equipment, all safe and well maintained.